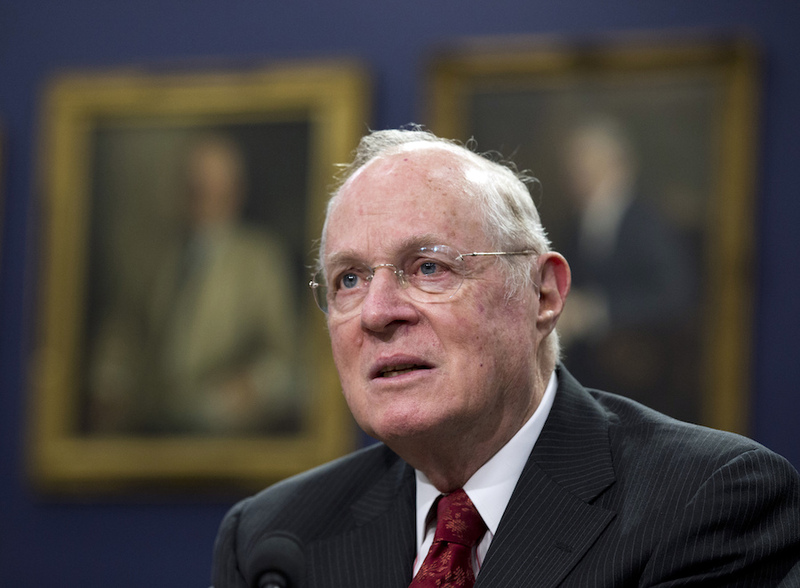 WASHINGTON (CN) – Justice Anthony Kennedy announced his retirement Wednesday afternoon as the Supreme Court adjourned for the summer. “It has been the greatest honor and privilege to serve our nation in the federal judiciary for 43 years, 30 of those years on the Supreme Court,” the 81-year-old Kennedy said in a statement. Kennedy submitted formal notification of his retirement to President Donald Trump, announcing that he will take senior status effective July 31. Nominated to the bench by President Ronald Reagan, Kennedy said he was retiring to spend more time with family. Considered a swing vote during his 30 years on the bench, Kennedy was key to majority decisions in landmark cases on abortion, affirmative action, gay rights, guns, campaign finance and voting rights. Until President Donald Trump appoints a successor, the court will be split between four Democrat-appointed judges and four judges named by Republicans. The Senate confirmed Trump’s first nominee to the Supreme Court, Justice Neil Gorsuch, in April 2017. Sen. John Kennedy, a Louisiana Republican who sits on the Judiciary Committee, said he is prepared to confirm Trump’s replacement as soon as possible. He said he has not looked deeply into the list of possible Supreme Court nominees the White House has maintained, but that he would like to see one of Gorsuch’s caliber. But just as Gorsuch was seen as a fitting successor to Scalia, Senator Richard Blumenthal said in an interview that Trump should appoint someone who will carry on Justice Kennedy’s legacy. “The president needs to nominate someone who is in Justice Kennedy’s mold, an open-minded and fair jurist who can be a centrist and listen to his colleagues and to the country about what is needed to protect our key rights and liberties,” said Blumenthal, a Connecticut Democrat who sits on the Judiciary Committee. “His jurisprudence on gay marriage and LGBT equality are rightly seen as landmarks,” said Michael Waldman, president of the Brennan Center for Justice at the New York University School of Law. “Still, his Citizens United decision gravely undermined our elections, and he most recently missed an opportunity to rule against extreme partisan gerrymandering. He retires leaving our democracy plainly weaker than when he joined the court. Alan Morrison, associate dean at George Washington University Law School, said in an interview that Kennedy has been a unique voice on the court, specifically in areas like the First Amendment and gay rights. Waldman at the Brennan Center noted that the retirement of a “perennial swing vote” like Kennedy amps the stakes. Senator Kennedy, who is a former adjunct law professor at Louisiana State University, said he has not agreed with all of Justice Kennedy’s decisions but that he respects his impact on the law and his approach to cases. Blumenthal called Kennedy’s retirement “earth-shattering and gut- wrenching” but said the Senate “should do nothing to artificially delay” consideration of Trump’s choice. On the Senate floor this afternoon, Republican Majority Leader Mitch McConnell, R-Ky., said he plans to confirm a replacement for Justice Kennedy in the fall, after lawmakers have had the chance to meet with and hold hearings on Trump’s choice for the seat. Blumenthal noted meanwhile that midterm elections this November could throw a wrench in the timetable. “The president should take the time that’s necessary, and it will be more than a month or two, to nominate someone who is open minded and fair, a jurist who has a track record in the mold of Justice Kennedy,” Blumenthal said. Senate Minority Leader Chuck Schumer, D-N.Y., called on McConnell to adhere to the principle he cited consistently in 2016 when he led the Republican blockade against the Scalia successor nominated by then-President Barack Obama. Just as Republicans refused to confirm Merrick Garland to the court during the 2016 presidential election, the Senate should not consider Kennedy’s replacement until after the 2018 midterms, Schumer said. “Anything but that would be absolute height of hypocrisy,” Schumer said on the Senate floor Wednesday.